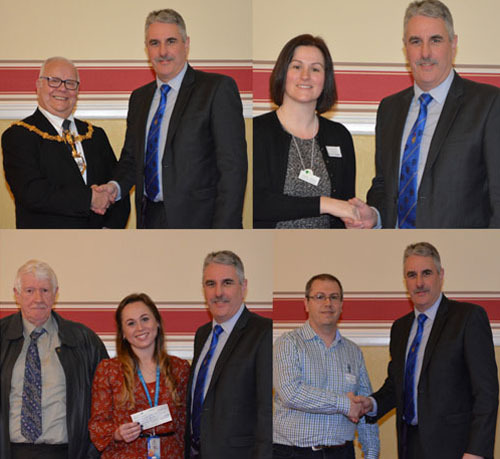 Freemasons within the Warrington Group of Lodges and Chapters have again donated large sums of monies to Masonic and non-Masonic charities within the locality. Truly astounding donations demonstrated the generosity of Freemasonry continues in the Warrington area. This was amply confirmed at an annual charity giving day at Warrington Masonic Hall. 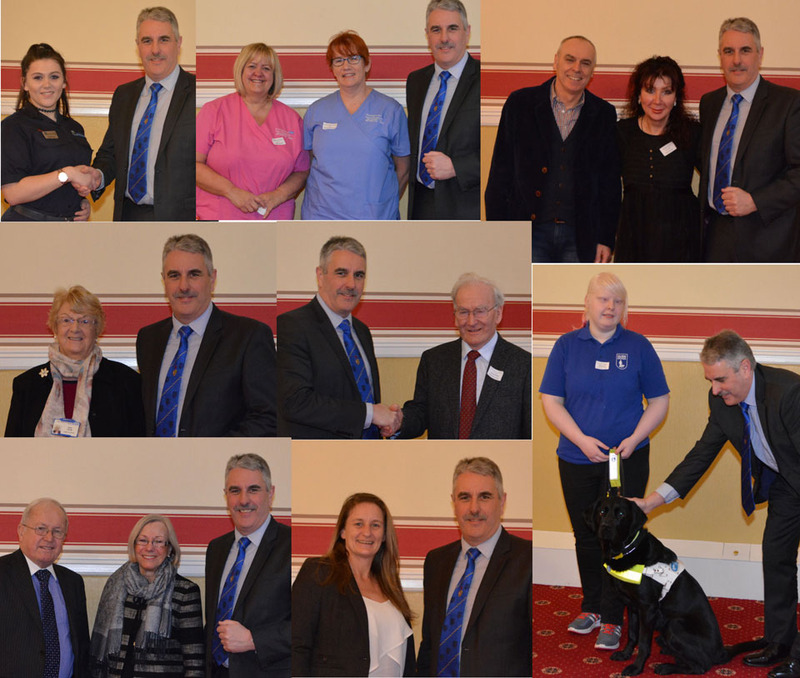 Over £30,000 was distributed to local and national charities, good causes and projects. Pictured left: Andy Barton. Pictured right: Kevin Poynton. Andy Barton, the Warrington Group Chairman, opened the giving day by welcoming all the visitors present, especially the principal guests, the Mayor of Warrington Cllr Les Morgan, Assistant Provincial Grand Master Kevin Poynton and Assistant to the Provincial Grand Principals Colin Rowling, saying how delighted he was to have them present to witness the support offered by the group for local charities and good causes. Andy continued by introducing the group officials, Chris Gleave, group vice chairman, John McIntyre, group secretary and Chris Todd, group charity steward. He then briefly explained that Freemasons are one of the largest contributors to non-Masonic charities. The causes supported range from international disaster relief, national charities, hospices and important local community based projects and charities. Andy explained that three levels of donations are provided, either directly from local groups and lodges, through our own West Lancashire Freemasons’ Charity or through our national Masonic charities. Ecclesholme Eccles, Warrington and Halton Hospital Neonatal Unit, Liverpool Heart Foundation, Alzheimer’s Society, The Walton Lea Project, Warrington and Halton Hospital League of Friends, Warrington Talking Newspaper, Royal Manchester Children’s Hospital, Warrington Masonic Hall, Warrington Museum of Freemasonry, Prostate Cancer UK, The Warrington Mayor’s chosen charities, Claire House Children’s Hospice, St Rocco’s Hospice and Guide Dogs for the Blind, just to name a few of the local charities and causes receiving support. 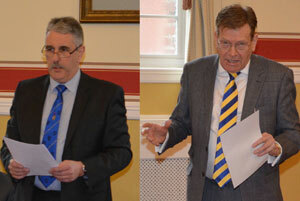 Pictured top left, are: Cllr Les Morgan with Andy Barton. Pictured top right, are: Rachael Ingham with Andy Barton. Pictured bottom left, are: Norman Pritchard, Ryhanna Morris and Andy Barton. Pictured bottom right, are: Darren Roberts with Andy Barton. Cllr Les Morgan, Mayor of Warrington, thanked the group for the support of his own charities and gave a brief explanation of his chosen charities, saying how grateful he was to receive the financial help towards his year in office. Rachael Ingham spoke on behalf of St Rocco’s Hospice; she briefly and very informatively explained how the donations would be applied to benefit the patients. Ryhanna Morris, representing Claire House Children’s Hospice provided a moving example of some of the work the hospice is involved in. She gave particular thanks to Norman Pritchard and his associates who have generated donations to help support the hospice by singing at various Masonic events mainly in the West Lancashire Province. Norman presented a cheque for over £500 which brings the amount generated to approximately £2,000. Dr Darren Roberts on behalf of Prostate Cancer UK gave an insight on his work based on research and how important it is to develop treatments to help overcome this disease. In conclusion, Chris Gleave, vice chairman, drew the meeting to a close by thanking everyone for their attendance and pointed out that the museum would be open for inspection, should anyone wish to visit. Happy faces of the recipients.